Malinovski, T., Vasileva, M., Vasileva-Stojanovska, T. & Trajkovik, V. (2014). Considering high school students’ experience in asynchronous and synchronous distance learning environments: QoE prediction model. 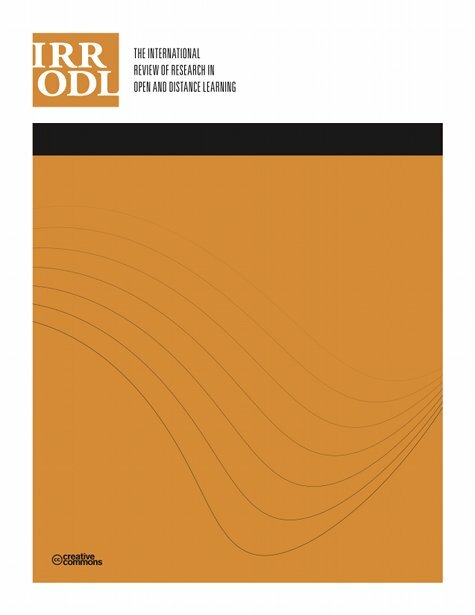 The International Review of Research in Open and Distributed Learning, 15 (4),. Athabasca University Press. Retrieved April 25, 2019 from https://www.learntechlib.org/p/148519/. Barbour, M. (2011). Today’s student and virtual schooling: The reality, the challenges, the promise. Journal of Open, Flexible and Distance Learning, 13(1), 5-25. Beldarrain, Y. (2006). Distance education trends: Integrating new technologies to foster student interaction and collaboration. Distance Education, 27(2), 139-153. Bentler, P.M., & Bonett, D.G. (1980). Significance tests and goodness of fit in the analysis of covariance structures. Psychological Bulletin, 88(3), 588. Bernard, R.M., Abrami, P.C., Borokhovski, E., Wade, C.A., Tamim, R.M., Surkes, M.A., & Bethel, E.C. (2009). A meta-analysis of three types of interaction treatments in distance education. Review of Educational Research, 79(3), 12431289. Bollen, K.A. (1998). Structural equation models. John Wiley& Sons, Ltd.
Byrne, B.M. (2001). Structural equation modeling with AMOS, EQS, and LISREL: Comparative approaches to testing for the factorial validity of a measuring instrument. International Journal of Testing, 1(1), 55-86. Cavanaugh, C., Gillan, K.J., Kromey, J., Hess, M., & Blomeyer, R. (2004). The effects of distance education on K-12 student outcomes: A meta-analysis. Naperville, IL: Learning Point Associates. Chang, S.H.H., & Smith, R.A. (2008). Effectiveness of personal interaction in a learner-centered paradigm distance education class based on student satisfaction. Journal of Research on Technology in Education, 40(4), 407-426. Chen, K.C., & Jang, S.J. (2010). Motivation in online learning: Testing a model of selfdetermination theory. Computers in Human Behavior, 26(4), 741-752. Chin, W.W. (1998). Issues and opinion on structural equation modeling. MIS Quarterly, 22(1), 7–16. Giancola, J.K., Grawitch, M.J., & Borchert, D. (2009). Dealing with the stress of college: A model for adult students. Adult Education Quarterly, 59(3), 246263. Cronbach, L.J. (1951). Coefficient alpha and the internal structure of tests. Psychometrika, 16(3), 297-334. Davis, F.D., Bagozzi, R.P., & Warshaw, P.R. (1989). User acceptance of computer technology: A comparison of two theoretical models. Management Science, 35(8), 982–1003. Donavant, B.W. (2009). The new, modern practice of adult education online instruction in a continuing professional education setting. Adult Education Quarterly, 59(3), 227-245. Eom, S.B., Wen, H.J., & Ashill, N. (2006). The determinants of students' perceived learning outcomes and satisfaction in university online education: An empirical investigation. Decision Sciences Journal of Innovative Education, 4(2), 215235. Gagné, R.M., & Medsker, K.L. (1996). The conditions of learning: Training applications. Fort Worth: Harcourt Brace College Publishers. Gong, Y., Yang, F., Huang, L., & Su, S. (2009). Model-based approach to measuring quality of experience. In Emerging Network Intelligence, 2009 First International Conference (pp. 29-32). IEEE. Hair, J.F., Anderson, R.E., Tatham, R.L., & Black, W.C. (1998). Multivariate data analysis (5th ed.). NY: Prentice Hall International. Hardre, P.L., & Reeve, J. (2003). A motivational model of rural students' intentions to persist in, versus dropout of, high school. Journal of Educational Psychology, 95(2), 347. Hew, K.F., & Cheung, W.S. (2010). Use of three‐dimensional (3‐D) immersive virtual Educational Research Journal, 36(3), 503-520. Janowski, L., & Papir, Z. (2009). Modeling subjective tests of quality of experience with a generalized linear model. In Quality of Multimedia Experience, 2009. QoMEx 2009. International Workshop (pp. 35-40). IEEE. Jaques, D., & Salmon, G. (2012). Learning in groups: A handbook for face-to-face and online environments. Routledge. Text‐based discussion. British Journal of Educational Technology, 39(1), 166Johnson, G. (2008). The relative learning benefits of synchronous and asynchronous 169. Joreskog, K.G., & Sorbom, D. (1984). LISREL VI user's guide. Mooresville, IN: Scientific Software. Khan, A., Sun, L., & Ifeachor, E. (2012). QoE prediction model and its application in video quality adaptation over UMTS networks. Multimedia, IEEE Transactions, 14(2), 431-442. Kilkki, K. (2008). Quality of experience in communications ecosystem. J. UCS, 14(5), 615-624. Kline, R.B. (2005). Principles and practice of structural equation modeling (2nd ed.). New York: Guilford Press. Knoche, H., & Sasse, M.A. (2008). Getting the big picture on small screens: Quality of experience in mobile TV. Multimedia Transcoding in Mobile and Wireless Networks, 31-46. Koutropoulos, A. (2011). Digital natives: Ten years after. MERLOT Journal of Online Learning and Teaching, 7(4), 1-21. Laghari, K.U.R., & Connelly, K. (2012). Toward total quality of experience: A QoE model in a communication ecosystem. Communications Magazine, IEEE, 50(4), 58-65. Lawson, T., Comber, C., Gage, J., & Cullum‐Hanshaw, A. (2010). Images of the future for education? Videoconferencing: A literature review. Technology, Pedagogy and Education, 19(3), 295-314. Lee, M.K., Cheung, C.M., & Chen, Z. (2005). Acceptance of Internet-based learning medium: The role of extrinsic and intrinsic motivation. Information& Management, 42(8), 1095-1104. Liu, I.F., Chen, M.C., Sun, Y.S., Wible, D., & Kuo, C.H. (2010). Extending the TAM model to explore the factors that affect intention to use an online learning community. Computers& Education, 54(2), 600-610. Malinovski, T., Lazarova, M., & Trajkovik, V. (2012). Learner–content interaction in distance learning models: Students’ experience while using learning management systems. Int. J. Innovation in Education, 1(4), 362–376. MacCallum, R.C., Browne, M.W., & Sugawara, H.M. (1996). Power analysis and determination of sample size for covariance structure modeling. Psychological Methods, 1(2), 130. Murphy, E., & Rodríguez-Manzanares, M.A. (2009). Teachers’ perspectives on motivation in high-school distance education. The Journal of Distance Education/Revue de l'Éducation à Distance, 23(3), 1-24. Murphy, E., Rodríguez‐Manzanares, M.A., & Barbour, M. (2011). Asynchronous and synchronous online teaching: Perspectives of Canadian high school distance education teachers. British Journal of Educational Technology, 42(4), 583-591. Nunnally, J.C., & Bernstein, I.H. (1994). Psychometric theory (3rd ed.). New York: McGraw-Hill. Oblinger, D.G. (2005). Learners, learning& Technology: The Educause Learning Initiative. Educause Review, 40(5), 66-75. Oztok, M., Zingaro, D., Brett, C., & Hewitt, J. (2013). Exploring asynchronous and synchronous tool use in online courses. Computers& Education, 60(1), 87-94. Powell, A., & Patrick, S. (2006). An international perspective of K-12 online learning: A summary of the 2006 NACOL International E-Learning Survey. North American Council for Online Learning. Robert, L.P., & Dennis, A.R. (2005). Paradox of richness: A cognitive model of media choice. Professional Communication, IEEE Transactions, 48(1), 10-21. Ryan R.M., & Deci E.L. (2000) Self-determination theory and the facilitation of intrinsic motivation, social development, and wellbeing. American Psychologist, 55(1), 68–78. Smith, R., Clark, T., & Blomeyer, R.L. (2005). A synthesis of new research on K-12 online learning. Naperville, IL: Learning Point Associates. Somenarain, L., Akkaraju, S., & Gharbaran, R. (2010). Student perceptions and learning outcomes in asynchronous and synchronous online learning environments in a biology course. MERLOT Journal of Online Learning and Teaching, 6(2), 353356. Steinweg, S.B., Williams, S.C., & Stapleton, J.N. (2010). Faculty use of tablet PCs in teacher education and K-12 settings. TechTrends, 54(3), 54-61. Stricker, D., Weibel, D., & Wissmath, B. (2011). Efficient learning using a virtual learning environment in a university class. Computers& Education, 56(2), 495504. Tüzün, H., Yılmaz-Soylu, M., Karakuş, T., İnal, Y., & Kızılkaya, G. (2009). The effects of computer games on primary school students’ achievement and motivation in geography learning. Computers& Education, 52(1), 68-77. Zapater, M.N., & Bressan, G. (2007, January). A proposed approach for quality of experience assurance of IPTV. In Digital Society, 2007, ICDS'07. First International Conference on the (pp. 25-25). IEEE. Xie, K., Debacker, T.K., & Ferguson, C. (2006). Extending the traditional classroom through online discussion: The role of student motivation. Journal of Educational Computing Research, 34(1), 67–89.